You probably associate Iowa with corn, but did you know that Iowa is famous for renewable energy too? A lot of that corn goes into the production of ethanol, a renewable fuel. Additionally, the Hawkeye State is one of the top states in the country for generating wind power. Strangely, solar power is not yet a priority in Iowa. As far as climate goes, Iowa is no stranger to stormy weather. Winters tend to be bitter and snowy. While spring is a relief in many parts of the U.S., the season means thunderstorms and tornadoes in the home of Des Moines. However, summers are hot and humid, providing plenty of rays for solar panels. So where’s the push for solar energy? There are some incentives for running on sun, but the state could do a lot more to encourage residents and businesses to switch to sunshine. Utility companies have fought the state over third-party ownership of solar power systems, which means there are no leasing arrangements available. Nevertheless, you have other options, which you can find out about here. 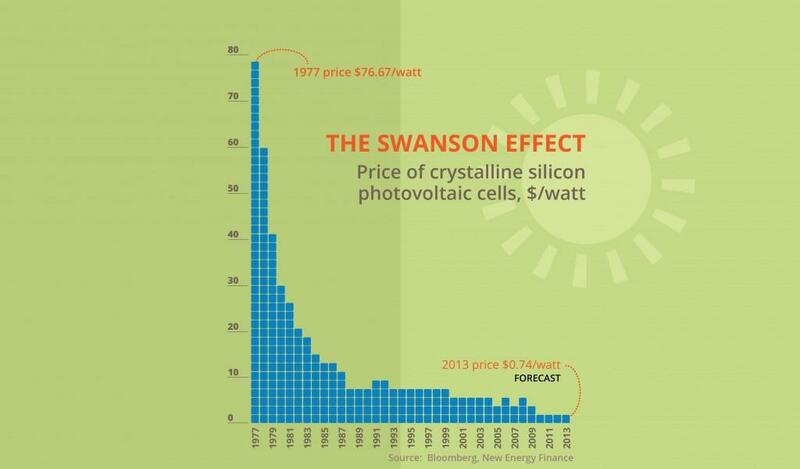 First, it’s important to understand how far solar prices have dropped in the last four decades. The Swanson Effect graph above shows how per-watt prices have come down from unmanageable levels to completely affordable household rates. It’s quite possible that advancements in technology will bring prices down even more in the near future. 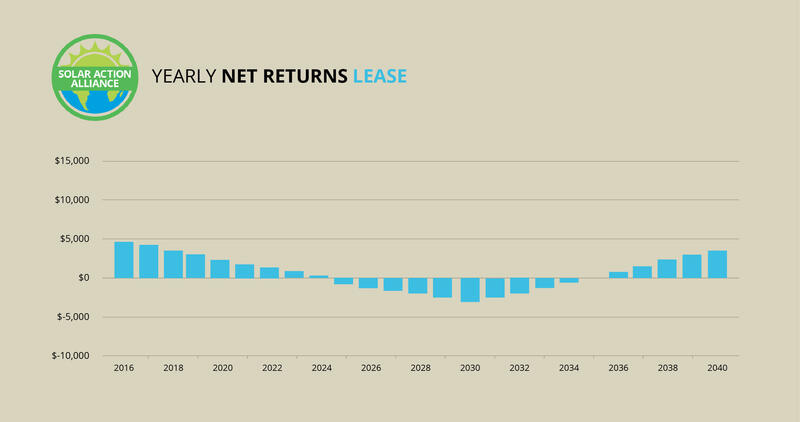 Now, let’s examine the return on investment (ROI) for solar panels in Iowa in particular. 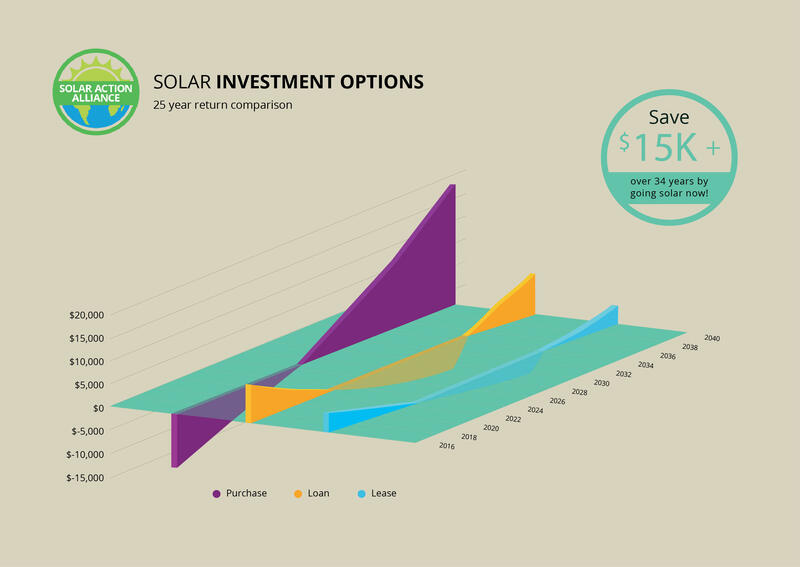 The chart above illustrates three options for converting to solar power and the ROI from each. In some states, this graph depicts a leasing option, but as mentioned, third-party agreements aren’t available in Iowa at this time. So instead, we’ve given you two loan options, depending on how much money you qualify for. Purchasing generates the most income for you over time, but it’s not an option if you don’t have extra cash on hand. Getting a home equity line of credit (HELOC) is a better choice in most cases, since you’ll put nothing down and still receive a tax break. A loan will cost you money while you’re repaying the loan, but you’ll still earn several thousand dollars over time. In some states, paying for a solar panel system up front is the most lucrative option. 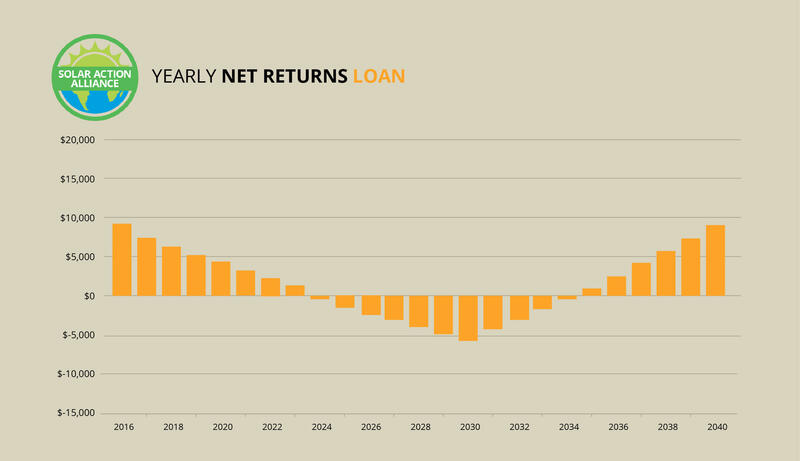 In Iowa, unbelievably, you get a better ROI from a loan. That’s not to say that purchasing is a bad idea. On the contrary, if you can afford to buy your system outright, you’ll earn the most money over a 25-period when compared with the two options below. And even though you’ll be laying out a substantial amount of cash for an installation, you’ll get a lot of that back through state tax credits and exemptions as well as a 30 percent federal tax credit. The graph above illustrates how a purchase looks over 25 years. Even if your system costs over $21,000 initially, you’ll really have spent only about $11,000 by the time you file your tax returns. At the end of the graph, you can see that you will have earned over $18,000! Because electricity in Iowa is so affordable, switching to solar power and paying for it with a loan only generates a few hundred dollars a year on average. 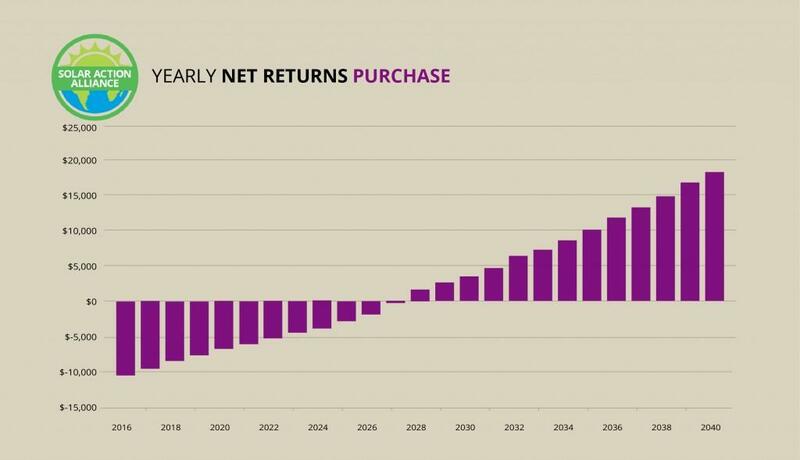 However, as you can see in the graph above, over a 25-year period, a loan will certainly bring you profits. It’s so easy, it’s almost like insider trading—but legal! When you take out a loan for the installation of a solar panel system, it’s a no-risk proposition. You use your bank’s money to pay for the system, but the first-year tax credits go directly to you. Although you’ll be making loan payments for the next 14 years, the difference between your old and new electricity bills helps a little bit when you make those payments. Once you repay the loan, your savings in electricity costs go straight to your pocket. You’ll save well over $1,000 a year for those last 10 years and end up with over $9,000 when all is said and done for your solar panels. If you qualify for a home equity line of credit (HELOC) of about $21,000 and qualify for a fixed interest rate of 5 percent or less, a solar panel system loan is your best bet. If you don’t have $21,000 worth of home equity, you can get a smaller loan and install a smaller residential solar energy system in Iowa. You won’t get rich, but you’ll still come out in the black, while the planet will come out in the green. If you install a 2-kW rooftop solar panel system for about $9,500 and pay for it with a HELOC at 5 percent interest over 15 years, you’ll earn a few thousand dollars over the life of the system. You’ll get your 30 percent federal tax credit right away, and although you’ll be making monthly loan payments, your monthly energy bills will go down. If the money isn’t enticing enough, do think about how your investment benefits others and future generations. When it comes to the RPS, Iowa isn’t doing so hot. The RPS is legislation mandating a partial switch to renewable power sources by a preset date. An RPS motivates utility companies to use alternative power so that they won’t have to pay penalties. 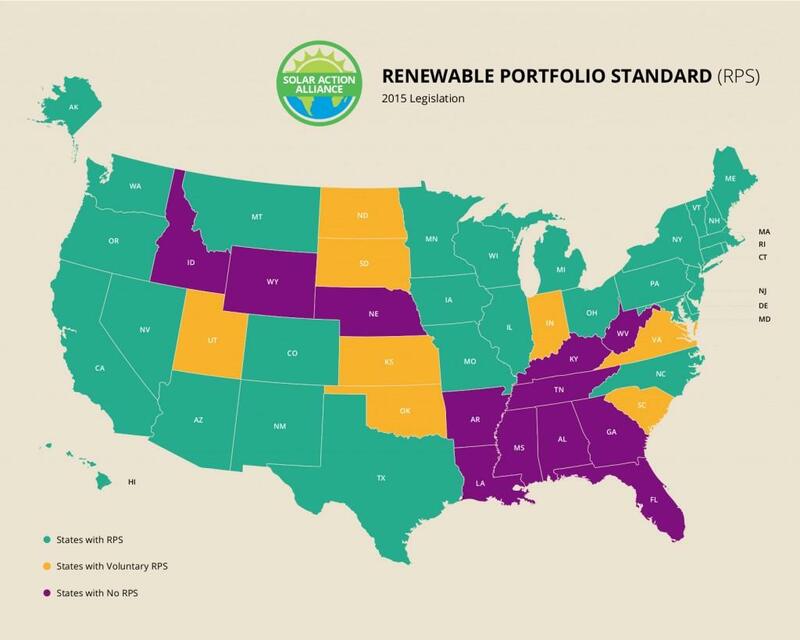 Although Iowa isn’t at the bottom of the barrel of solar-friendly states, its RPS is lacking. Iowa’s RPS targets are so low that they’ve already been met for some time. That’s mainly because Iowa generates 5,177 MW of wind power, and the RPS only mandates 105 MW from renewable power sources for two major utility companies. If the state would simply increase its standards and make some provisions for solar power specifically, Iowa would burn much brighter. 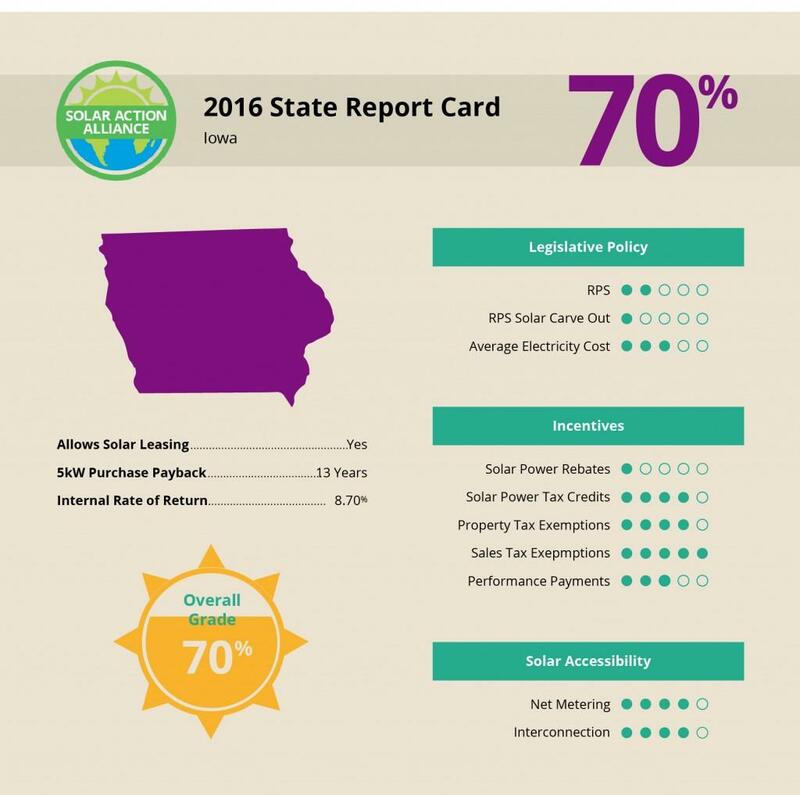 Overall, Iowa brings home a “C+” on its solar report card. This isn’t the best place to convert to solar, but it’s not the worst, either. To its credit, the state does offer a sales tax exemption, property tax exemption, tax credits, net metering, and interconnection. On the other hand, Iowa is weak in terms of its performance payments, solar carve-out, rebates, and RPS. Start-up costs are higher in Iowa than they are in other states, so the payback period is longer than it should be: about 12 years, far from the ideal of about eight. A better RPS could bump Iowa up into the “B” class.